AMS Neve introduces DFC3D, the latest incarnation of the brand's DFC series of digital mixing consoles. Soundcraft presents the Vi2000, the most compact version in the brand's Vi series of digital consoles. Allen & Heath present the Qu-SB, a compact digital mixer and interface designed for iPad control. Avid setails its new Venue S6L live mixing system series with a live webinar dedicated to it. To accompany the future launch of its v1.8 Chrome fireware, Allen & Heath releases new Chrome Editions of its Qu series compact digital mixers. Allen & Heath will introduce at InfoComm this week their new series of live digital consoles, called dLive and featuring three models. 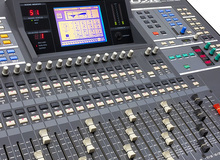 Mackie offers users of its DL32R digital mixer an expansion card that will add the console to any Dante audio network. DiGiCo introduces at Musikmesse the upcoming S21 digital mixing console with 96 kHz support and touch screens. Cadac introduces at Musikmesse 2015 the latest member in the CDC series of digital console, called CDC Six.